PRIVATE: Private classes are one to one in my teaching studios in San Diego County in California and Baltimore County in Maryland, USA at convenient days and times for students. K.S. Resmi is an expert professional teacher and performer of authentic Carnatic music vocal lessons with a step by step program covering all the basics to advanced taught in the proper manner. All students receive written and audio materials of the lessons taught each week. Lessons fees are paid by the month and can be sent by check in the mail or conveniently with online payment systems such as PayPal. All online students participate in online concerts. All students can participate in the Annual Day Award & Concert. Some of K.S. 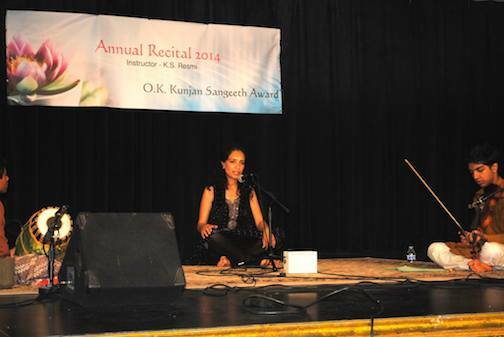 Resmi’s private students performing at the Annual Day Recital & Competition – Dr. Rupinder Sandhu accompanied by Kamalakiran Vinjamuri (violin) & Srikar Chittari (mridangam).